Meee has embarked on a new and exciting adventure working with a group of families from Flint High School. The ‘Meee & My Family Programme’, which will run for four weeks, aims to improve family communication as well as overall confidence amongst a group of year 7 students. With an amazing turnout, it was great to see families of varying make-ups voluntarily coming together to discuss difficult topics and engage in at times, some very emotional topics. Mum of three, Angela, said she wanted to attend the programme to help her daughter feel more confident whilst she was at school and show her support by working alongside her. Angela’s son, Owen, is also apart of our ‘Fabulous 15’, a group that Meee are working closely with, aiming to boost confidence through self-development exercises and outdoor activities. Common themes amongst the students and parents included anxiety, stress and general nervousness about life and being in High School. 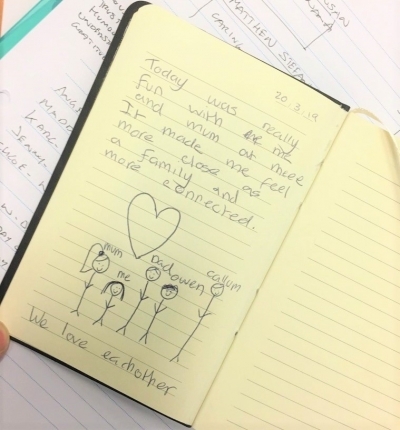 By exploring feelings, values and life in general and these meant to each of them as a family, it was great to see families recognise their common interests and begin their journey, working towards a common goal together. We hope that over the next few sessions we will be able to help students and parents alike feel more confident about who they are and what they can achieve once they put their mind to it. Our aim is to make learning fun, helping the families to feel closer together and enjoy life together as a family unit. Facing hard times is easier together and helps with understanding each other better. If you are looking for some great tips and tricks to boost your confidence as well as your self-esteem, Sid's novel, Meee In A Minute: 60 Ways To Improve Your Life in 60 Seconds is available here! "A challenge only becomes an obstacle when you bow to it"
so why not stay in touch?